Located on an altitude of over 1,000 meters over sea level, the plateau of Bokor is like Sapa in Vietnam of the Kingdom of Cambodia with cloud covering all year round. Standing in Kampot plain looking up, the mountain is shaped like the hunchback of a cow (in Khmer language, Bokor means the hunchback of cows), for that reason, it was named Bokor . 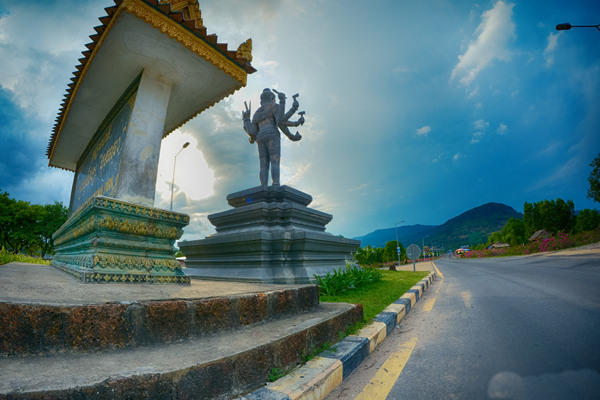 From Kampot plain, visitors have to go through a long pass road of 32km to the summit of the mountain. Leaving behind the noisy, bustling life of the plain, visitors only see the winding road with the vast green of the trees, the birds singing, the sound of animals calling each other ... The blue of the sky, of the sea, the green of unspoiled forests appear in the eyes making visitors who come here for the first time be amazed with the beauty of the most beautiful mountain pass road in this country of temples. The higher, the lower temperature, clouds covering the mountain a both fanciful and mysterious, attractive beauty for Bokor plateau. According to several documents, Bokor plateau was once a luxury resort of the French in the early 20th century, therefore, it had a full range of services from restaurants, hotels, casinos to schools, post offices, churches, royal palaces... 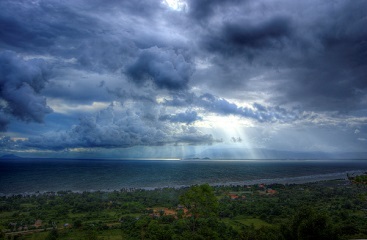 When the French withdrew, Bokor became a relaxing place of Shihanuok royalty or the rich in Cambodia (in about 50s- 60s). 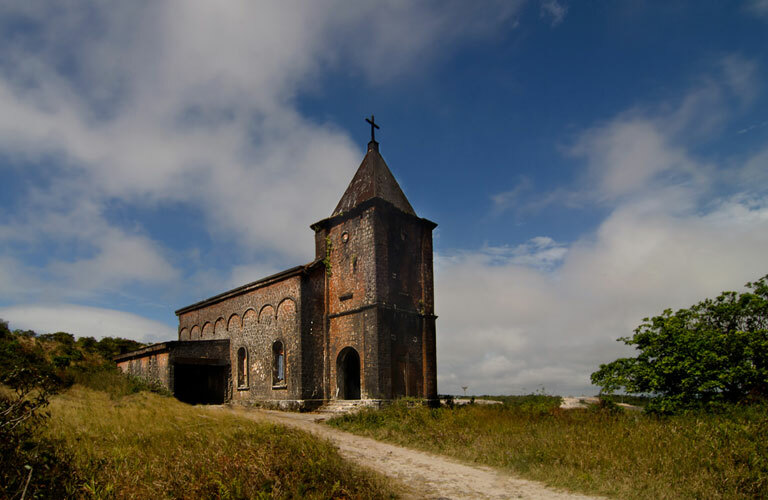 However, Bokor plateau was gradually abandoned and forgotten, from a place used to be such a paradise, it was called a 'ghost town', apart from the left casino and the church, the other parts were only the rocks, the decayed mortar walls. 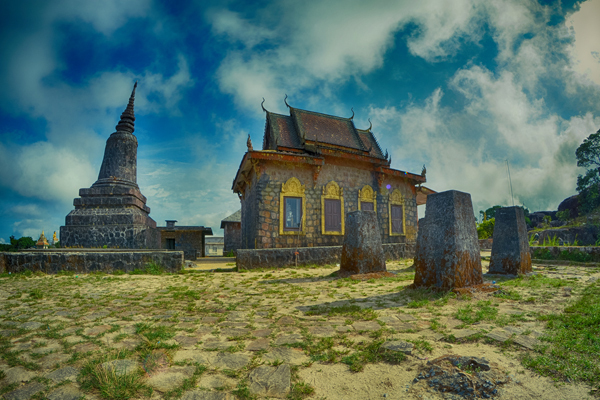 Bokor also has many famous attractions, places to take photo that visitors should not be overlooked including: Pram Samprov temple (also called Temple of the Five Boats), built in 1924 by King Monivong. The temple is small but stunning with large rocks shaped like the fossil boats (hence, it is called Temple of the Five Boats) associated with the legend of the mysterious love story of prince Preah Thong and Aquarium Princess Nagani building their own kingdom. From Temple of the Five Boats, visitors can see ancient casino and the abandoned hotel built by the French in the early 20th century hidden in the mist. Not far away is the cathedral with mossy brick wall. When the evening falls, the church is hidden in the clouds creating a fully mysterious scene. This Catholic church was built by the French in the early 20th century for the French authorities to pray when coming to Bokor to relax. Another ideal destination here is Popokvil waterfall (which means the clouds hold). The most beautiful time of the waterfall is about from May to October (in rainy season). 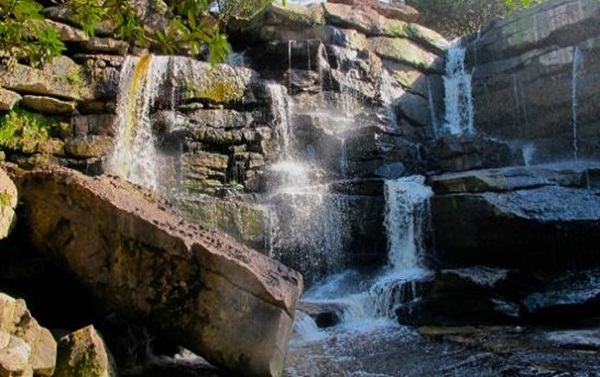 The waterfall has 2 floors, the upper floor is about 15 meters high, and the lower is about 18m. Not only is Popokvil the place where you can soak in the hot days, the waterfalls is also an excellent place for you to take pictures. Visitors also can visit the statue of Ya Mao (mother Mao', the lakes ... Besides, Bokor has fresh air, cool climate, so it is very suitable for visitors to go hiking or biking on the winding slopes.